The Light Storm COB120 is the first Chip-On-Board design of the Aputure Light Storm series. It features two models with two different colour-temperatures: the LS C120t (3000K) and the LS C120d (6000K). With these two powerful variations of the same great light, the Aputure Light Storm is more versatile than ever. The COB120 uses the popular industry Bowens mount, which is incredibly flexible for mounting any accessories. Through its compatibility with both third-party accessories and Aputure's light-shaping tools such as the Aputure Light dome Parabolic Soft Box, Umbrella and Fresnel Mount, the COB120's versatility allows it to achieve any desired lighting effect. Featuring an aircraft grade-aluminium body, the LS C120 is remarkably tough and durable. It undertakes more than 100 fabrication procedures such as extrusion, cutting, trim, sandblasting, oxidation and laser engraving. The delicate design and elaborate production make the COB120 both sleek in design and robust. The Kit Version of the COB120 includes an Aputure-designed soft case, which is fitted perfectly for your light and its safe travel. 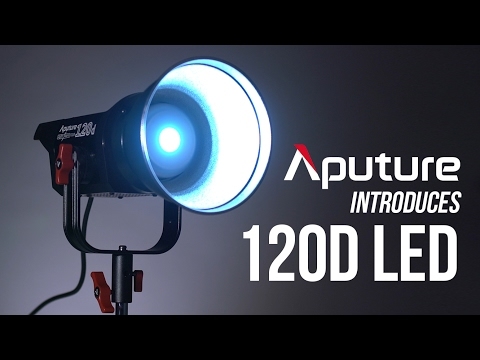 The Aputure LS 120 features a CRI rating of 97+. For an even more precise measurement, its TLCI is also rated at 97+ as well. TLCI, Television Lighting Consistency Index, is the most professional measurement of colour fidelity. It reveals how well a light source renders colours for film or photography context. Click the link to download the product manual for Aputure LS C120d Light.